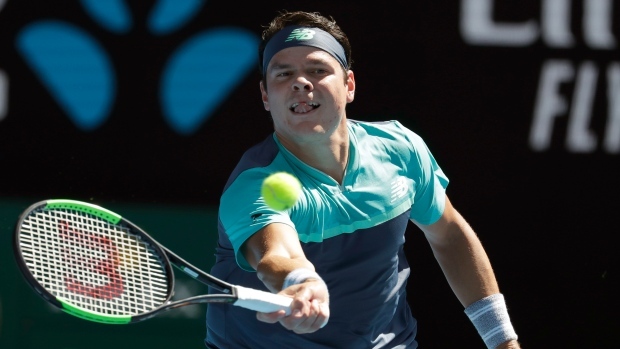 INDIAN WELLS, Calif. — Canada's Milos Raonic is heading to the round of 16 at the BNP Paribas Open after a come-from-behind victory on Monday. The No. 14 seed downed American qualifier Marcos Giron 4-6, 6-4, 6-4 in a third-round match, continuing an impressive run of success for Canadians at the event. Felix Auger-Aliassime, an 18-year-old from Montreal, lost to Yoshihito Nishioka of Japan 7-6 (2), 4-6, 6-7 (5) in a third-round match later Monday. Denis Shapovalov, a 19-year-old from Richmond Hill, Ont., and 18-year-old Bianca Andreescu of Mississauga, Ont., had Monday off after winning matches on Sunday. The 24th-seeded Shapovalov will face No. 10 seed Marin Cilic of Croatia in a third-round match on Tuesday, while Andreescu will square off with No. 18 seed Qiang Wang of China in a fourth-round match on the women's side. Raonic's win was the seventh in a row for Canadians in singles at the event. He will next face Germany's Jan-Lennard Struff, who upset third-seed Alex Zverev 6-3, 6-1 in the third round. After fighting back from a first-set loss, Raonic found himself down a break at 3-0 against the 217th-ranked Giron in the third set. But the 28-year-old from Thornhill, Ont., recorded two breaks to take a 5-4 lead before serving out the match. Giron, an NCAA singles champion in 2014 while attending nearby UCLA, had the support of most of the fans at the facility's main stadium as he flirted with a major upset. Prior to this week, the 25-year-old Giron had won just one tour-level match in four main-draw attempts. The Californian's career was slowed by a hip injury in 2015, requiring surgery. Raonic had a 55-23 edge in winners, but made 14 more unforced errors than the American (31-17). The big-serving Canadian had 22 aces, compared to just three for Giron. While Raonic has plenty of experience at big events, the other Canadians are just getting their feet wet at this level. Auger-Aliassime pushed Nishioka to the limit in a three-set duel that stretched to two hours 55 minutes 49 seconds, the longest match of the young Canadian's pro career. After trading sets, Nishioka took an early lead in the third before Auger-Aliassime battled back to tie it 5-5. Nisioka took a 6-5 lead before the Canadian again climbed back into the match, smashing an ace to tie it up. Auger-Aliassime, fended off three match points to keep it neck-and-neck but his forehand skimmed off the top of the net, redirecting the ball's trajectory so it landed out of bounds to give Nishioka the win. With the younger Auger-Aliassime and Andreescu both posting upsets earlier in the tournament, the 19-year-old Shapovalov has become a bit of a veteran voice for the Canadian teen trio. "To be honest, I'm not shocked (about Auger-Aliassime and Andreescu's runs)," Shapovalov told reporters Sunday. "I mean, like, I was telling everybody, it’s just a matter of time until Felix and Bianca show up. They both had unbelievable games in the juniors, and I grew up with both of them. So honestly, I knew the potential they have, and I knew it's just a matter of time until they are gonna have these big results. "I'm really happy for them. They are both really good people. And hopefully we can just keep going like this to make tennis a really big sport in Canada." The tournament has taken notice, referring to the success as a "Canadian crusade" on its website. "We're all killing it. It's great," Andreescu said. "We have played so many junior tournaments together, and it's so nice to see each and every one of us at the top of our game at this stage in our life, only 18, 19, which is pretty incredible. "I think all that really contributes to our successes. We motivate each other." Ottawa's Gabriela Dabrowski also remains alive in the doubles draw. The fifth-seeded team of Dabrowski and Yifan Xu of China will face Darija Jurak of Croatia and Raluca Olaru of Romania in the quarterfinals.